This tab was designed as an upper mount for your motorcycle rear fender, though it can be used universally to mount anything you like. It is 1/4 inch thick mild steel and has a 90 degree bend and a 5/16 inch diameter hole in it. This will work well with most any flat or trailer fender custom rear motorcycle fender and saves a lot of time and hassle in the garage. 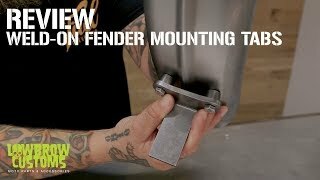 Check out the Weld-On Lower Fender Mount Tab, DIY Fender Strut Kit and DIY Sissy Bar Kits to finish mounting your fender. Made in the USA. Great setup. Easy to cut old frame and it fit right up to it perfectly. Great service, speedy shipping, fantastic products...a great value! Lowbrow's fabrication parts are not only the best quality for fit and materials, they save so much time during a build it's ridiculous. Prices on parts are much better than you'll find in the big catalog parts houses, not to mention the cool hard to find stuff. Lowbrow Customs is the real deal. Great parts. Great prices. Good piece of fab material. Good quality as always. Good vendor! Now I need to get the tail lights mounted. This part was exactly what I needed , a good solid piece of steel. Fast shipping at a fair price.